300MW, the first plant of this size in the private sector, is also one of the main conflictual plants in Kinnaur valley. Workers also join hands with affected communities under the slogan "Kinnaur Bachao"
The project is located on the river Baspa, a tributary of river Satluj in Kinnaur District of Himachal Pradesh; the river originates from Baspa Bamak Glacier of great Himalayan ranges at an elevation of 5800 m. The diversion barrage is located on river Baspa at village Kuppa near Sangla and the power house is located near village Karcham about 800m upstream of the confluence of rivers Satluj and Baspa on NH-22 (Hindustan Tibet Road). Baspa Stage –II project has Karcham-Wangtoo hydel project on its downstream. 300 MW Baspa Stage II Project is the first Independent Power Producer (IPP) project after the Government of India liberalized the power policy by inviting private sector participation for setting up hydropower project on “BOO” basis. Baspa Hydro-electric project stage II (300 MW) is the first plant of this size in the private sector. The MOU was signed with Government of Himachal Pradesh in November, 1991 on "Build, Own and Operate" basis. The plant was fully commissioned on 8th June, 2003 and has since been generating power. In 2014, the plant was bought by JSW, together with Karcham Wangtoo hydroelectric plant for US$1.8 billion. 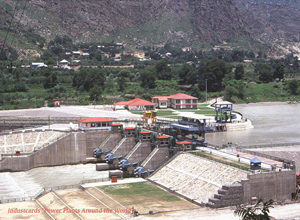 The Baspa II plant is one of the many projects in cascade in operation or under construction in Kinnaur on the Satluj river or its tributaries. The identified potential of the basin is close to 13000 MW, with 51 small and 23 large projects. Six of these projects — producing 2,956 MW of power — are already operational, while the rest are in various stages of development. People of the region are opposing teeth and nails the mashrooming of hydel plants for the enormous environmental impacts and for the damages of the prosperous apple production, along with soil erosion, landslides, degraded roads, water sources drying up, damages to the houses and cracks etc; protests address especially three big projects — Nathpa Jhakri (1,500 MW), Karcham Wangtoo (1,000 MW) and Baspa II (300 MW) — which were commissioned in the last 10 years. In June 2013, while the world watched images of concrete habitations being swept off along the river beds of Alaknanda and Bhagirathi—both tributaries of the Ganga- , a calamity on a similar scale was unfolding in the neighbouring region of Kinnaur, which got little media attention. The rain and snow caused serious floods, landslides, erosion and damage to agriculture fields, apple orchards and cattle apart from disrupting daily life. The infrastructure of the region collapsed causing losses estimated at 2500 crores. But more than anything the floods once again highlighted the fact that large scale construction activity in this region was likely to further exacerbate the erosion and destabilise the slopes, the impact of which would be multiplied at the time of heavy rains and floods. Areas where projects’ roads and tunnels had been constructed since then have experienced landslides on an unprecedented scale. In January 2015, a panel of experts set up by the Government of Himachal Pradesh (PESE - Panel of Environmental and Social Experts) observed that "popular opposition to large hydel power projects on the Sutlej is being fanned by the establishment’s “indifference” to the problems of the people". The panel also studied the draft Cumulative Environment Impact Assessment (CEIA)  report prepared on the directions of the union Ministry of Environment, Forests and Climate Change, said the CEIA’s conclusions were “a matter of opinion and not supported by facts and figures”. It was also criticized that some of the institutions tasked with studying the impact of hydropower development didn’t even meet local people, and the indifferent manner of the exercise has only widened the trust deficit between the people and government agencies. During a recent travel to the valley, a team of Himdhara collective met with local project affected families of various areas of Kinnaur district. What they witnessed is narrated in the article "Kinnaur’s Curse? ", that confirms the concerns raised by the group in response to the Cumulative Environmental Impacts Assessment  for the Satluj basin. According to the collective, with these developments there has been a definite shift in the mood and local acceptance to hydropower. “The (2013) calamity brought disappointment but it also brought hope that at least now people will begin to understand what kind of development this region cannot take,” said a local man referring mainly to the unplanned and massive hydroelectric project proliferation in the region. Some of the villages there already announced they will not grant the No Objection Certificate (NOC) required per law for other projects planned in the area. In the last two years (2014-2015) something has given new momentum to the local resentment around Baspa II and the nearby Karchham-Wangtoo plant: Jaypee Union workers, who have been trying to negotiate with the management on fair and minimum wages, housing facilities, and implementation of other provisions for workers under the Factories Act. When they were not heard they registered the union in 2014. They started the negotiations as a union since 15 October 2014. According to the union secretary, “This is a company that has won many awards for its performance in generating electricity but has no respect for its workers and their safety,”. While the government awarded the company for good performance in Baspa II , many workers were injured during work or lost their lives in return for little or no compensation. Of the 1800 people employed by JPVL (Jai Prakash Ventures Limited) in the Karchham Wangtoo and Baspa projects, close to 1364 are part of the strike, which has crossed over a 100 days. As per June 2015, JPVL has been trying to sell Baspa II (along with Karchham-Wangtoo) first to a Abu Dhabi-based company, then to the JSW Group ), citing financial constraints; this encouraged the workers from both projects to organise themselves. Interestingly, in a large mass gathering organised by the union on 19 March 2015 the call that was given was “Kinnaur Bachao”, comprising this way to whole valley. 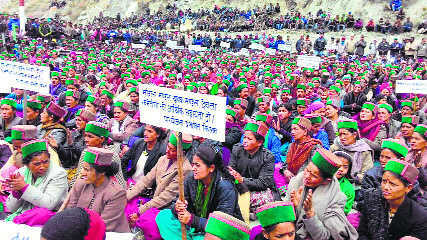 They demanded that 1% royalty be paid to all families of the project affected areas as one of its top demands. That was a strategic move to gain local support which the workers did manage to garner. While the sale has yet to be finalised, the workers issue remains unresolved. Project Details The Baspa project is a run-of-the-river hydro-electric power plant with an installed capacity of 300 MW.The diversion barrage of the project is located across river Baspa, one of the major tributaries of river Sutlej, at Kuppa in Himachal Pradesh. The power house is located at Karcham, Kinnur District, Himachal Pradesh. Water is diverted from the barrage to the power house through a diversion barrage. The water is conducted/passed through a head race tunnel of about 7.95 km long and steel lined pressure shaft about 845 meters long to create a design head of 702 meters for running 3 pelton turbines of 100 MW each. Development of Alternatives No clear alternatives to the project have been proposed, as people do not agree with having such large infrastructures in the area. Local farmers earn good living with apple orchards they want to defend. Workers demanded that 1% royalty be paid to all families of the project affected areas, along with safety measure for them during constructions works and fair wages. Why? Explain briefly. Despite mobilization for heavy impacts and victims of lack of safety measures during constructions, the project has been commissioned and is operating. Poor compensation given to only some of the entitled families.